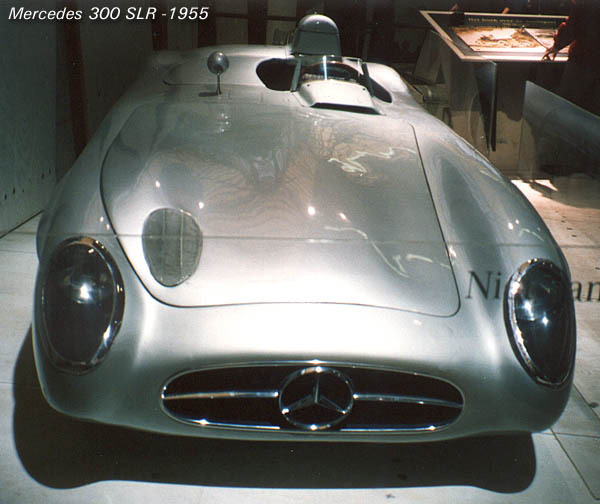 The concept of the 1952 300 SL by chief of construction Nallinger and engineer Uhlenhaut was continuously further developed. In SLR form it came very close to being a Grand Prix car for the road, adopting for instance the ultra-thin "Electron" (an aluminum-magnesium alloy) material for its light-weight skin and the desmodromic operated valves in the engine from the W196 Grand Prix car. The design of the bodywork was largely dictated by "form follows function" with a for that time remarkable attention for streamlining. As almost by accident a beautiful and elegant shape was created, defining the classic sportscar look from the mid-fifties up to the late the sixties. 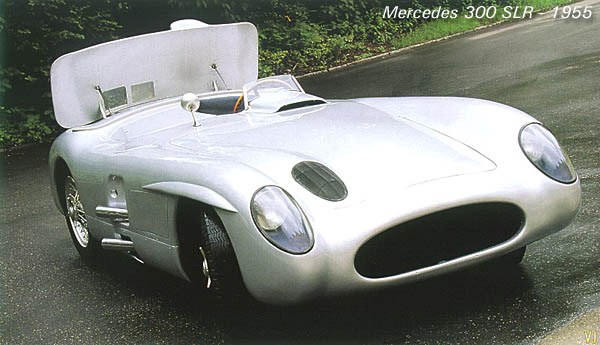 For high-speed races like the Le Mans 24 hours endurance race Mercedes developed a special trick for the 300 SLR. It had an additional "air-brake" behind the cockpit to reduce wear on the traditional brakes. At the end of long straights on which a very high top speed was reached the air-brake was activated. The panel behind the driver was mechanically erected while braking, increasing drag to a maximum and causing the car to slow down much faster. After the braking was done the panel folded neatly into place again, and the SLR returned to its air-cheating slippery shaped self to accelerate out of the corner as fast as possible. 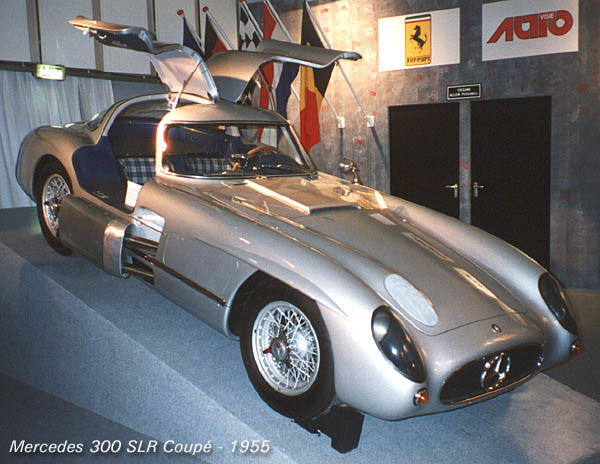 The rarest 300 SLR is the Coupé, which looks a lot like a regular 300 SL but is quite a different car. Only two have been built and this is the one that Mercedes engineer Rudolf Uhlenhaut used as a means of daily transport. Basically it's an open top full-race 300 SLR fitted with a bulbous closed two-seater cockpit and the "gullwing" doors of the 300 SL. If you look a bit closer you'll see the many differences with a regular 300 SL Coupé (for instance no triangular side windows behind the doors, no eyebrows above the rear wheels and a much more streamlined front). Since it's in full-race spec it has the straight 8-cylinder 3 litre fuel-injected engine, good for 300 hp and a top speed touching 290 kph. It's said to be one of the loudest cars on earth, producing an ear-shattering engine roar. To make the car acceptable for normal road use a big muffler is attached to the exhaust pipes on the side. 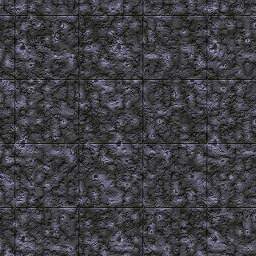 It's the big box beneath the door. Use this link for some additional 800x600 pictures of this great car!